Can a demonstration of the universal conflict between comedy and tragedy make for an entertaining movie? 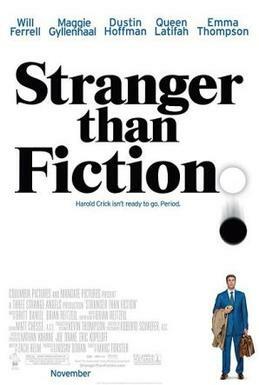 Stranger than Fiction is exactly that and yet, essentially experimental as it is, it makes for a surprisingly entertaining, even riveting, narrative. Harold Crick, the protagonist, an Auditor with the IRS. Karen Eiffel, a death-obsessed writer with writer’s block. Ana Pascal, the young, attractive, proprietor of a bakery. Jules Hilbert, Professor of Literature at the University of Illinois, Chicago. Harold (an excellently understated Will Ferrell) leads a quiet, taciturn, and methodical life. He lives by the clockwork of his digital wristwatch and the precision of his analytical brain. He lives, eats, works, and sleeps by himself. His is, by all accounts, a boring and lonely life, and he himself is, ostensibly, a boring person. However, his well-oiled-machine-of-a-life comes to a creaking halt when, one fine morning, as he brushes his teeth, he hears a female voice in his head. And not just a voice—a voice that, incredibly, seems to be privy to and narrating that very moment of his life: his acts and his thoughts as he brushes his teeth. We, the viewers, know (this is not a spoiler) that this is the voice of Karen Eiffel (an eccentric Emma Thompson), a celebrated writer who at that very moment is working on a novel about a character called…Harold Crick. Karen is also going through a severe period of writer’s block and is terribly obsessed with death. Karen’s voice is rather capricious and intermittent, as befits a writer with writer’s block; and on the first day that he hears it, Harold, for the first time ever, misses the bus he takes to work. At work, he is assigned the onerous task of auditing Ana Pascal (a spirited Maggie Gyllenhaal), who runs a small café-bakery; and who, as an expression of rebellious dissent at the government’s exorbitant defence expenditure, has refused to pay part of her taxes. The first time that Harold meets Ana, not only does he find her attractive, but he ends up ogling at her. And things are not helped by Karen’s voice in his head that kicks in on cue, with a meticulous and verbose delineation of his sensual thoughts and borderline-sexual fantasies. Ana makes Harold’s life miserable by deliberately messing up her carefully filed papers. However, she eventually warms up to him. Meanwhile, Harold’s trustworthy wrist watch stops working, and, at the very moment it does so, he hears Karen’s voice say, “Little did he know that this simple, seemingly innocuous act would result in his imminent death.” Scared, unnerved, and helpless, he consults a psychiatrist who is absolutely certain that he has schizophrenia and suggests that he take medication for it. Unconvinced, Harold reaches out to someone with an understanding of the way narratives work: a professor of literature. Enter Prof. Jules Hilbert (Dustin Hoffman, who turns in a warm and humane performance). Hilbert, who initially takes Harold to be some kind of crackpot, is convinced as soon as he hears the words, “Little did he know.” He suggests that Harold keep a count of elements of comedy and tragedy in his life to help infer his life’s narrative turn and its, as yet, unknown author. At this point Harold’s story is neatly poised in such a way that it could soar into the heights of comedy or veer into the depths of tragedy: He’s met a girl he’s irresistibly drawn to, but she seems to hate him. There’s a voice in his head. And worse of all he might end up dead. But events conspire narrative turns that quickly acquire an overwhelming air of comedy: Harold takes an extended break from work and discovers a latent passion for music—he starts playing the guitar. Ana, quickly realising the kind of person Harold, at heart, is, falls for him. The narrative, then, seems, in spite of doubts, to be heading towards a “and they lived happily ever after” kind of denouement. And it does, until Harold recognises the voice of an author, in an interview on television, as the voice he hears in his head. And Prof. Hilbert realises that the author in question is Karen Eiffel, a novelist notorious for killing off her heroes. To say anything more would be to spoil the movie for those who are yet to watch it. However, what follows is one of the most lucid elucidations of the power of tragedy, the merits of comedy, the relationship between these two opposing narrative forces of literature, and their relationship to life. It isn’t a spoiler to say that one of the last scenes in the movie depicts Harold going through the daily motions of his life, fully aware of the fate he is walking towards. It’s the most moving scene in the movie, and it has the moral heft of a tragedy. That—against all principles of tragedy—this scene loses none of its power after the movie reaches its conclusion is one of the achievements of Stranger than Fiction, and its makers, writer Zach Helm and director Marc Forster. This entry was posted in Movie Review, Movies, Notes on Movies and tagged Ana Pascal, comedy, Dustin Hoffman, Emma Thompson, Harold Crick, Jules Hilbert, Karen Eiffel, Maggie Gyllenhaal, Marc Forster, Movie Review, Movies, Stranger than Fiction, tragedy, Will Ferrell, Zach Helm. Bookmark the permalink.